Home / Blog / news / Presenting Morgan Page for his only Orlando appearance of 2014!! 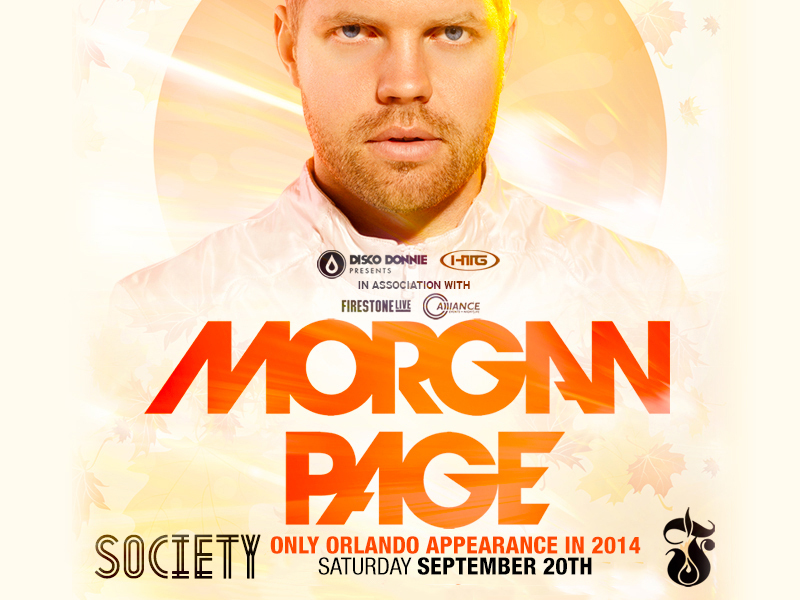 Presenting Morgan Page for his only Orlando appearance of 2014!! HTG Events and Disco Donnie Presents are proud to announce Morgan page September 20th, 2014. Big fan of Morgan Page? Don’t want to miss him? Make sure you come to Firestone Live for his only Orlando performance of 2014! Morgan has been on the up rise since the age of 15 when his music started being played across the local college networks and Vermont radio stations. At his start he spent majority of his money to save for studio equipment in hopes of following his dream of becoming a producer and artist. Armed with an Akai MPC2000 and a few borrowed synthesizers Morgan wrote the Maple Grooves EP on a sweltering August evening for Salzer’s Fiji imprint and never looked back. Morgan later continued his college radio career at WERS 88.9 FM in Boston, hosting a weekly mixshow for three years and becoming station manager of the largest and most influential college radio station in the country. Now, at age 24 with several remixes under his belt for Grammy nominee Wax Poetic (Norah Jones), Rachael Starr, Jean F. Cochois, Terry Lee Brown Jr., Nigel Hayes, Home & Garden, and dozens of critically acclaimed EPs out on labels like Bedrock, SAW, and Nordic Trax – Morgan has established himself as a profound producer and highly sought-after remixer. Recently, his music has garnered support from a wide-range of top level DJs including, Sasha, James Zabiela, Deep Dish, Danny Tenaglia, Roger Sanchez, Dave Seaman, Hernan Cattaneo, John Digweed, Mark Farina, and Jason Bentley. Several companies have also chosen Morgan’s music to set the tone for their movies, TV shows, and retail stores nationwide including: Sephora, Calvin Klein, Chanel, Bebe, Adidas, Nike, Abercrombie & Fitch, Ecko Clothing, and The Showtime Channel. Currently Morgan lives in Los Angeles where he cooks up all the amazing sounds we all love so much! So get to Firestone September 20th and be ready to dance!! Please visit www.htg-events.com for more information!